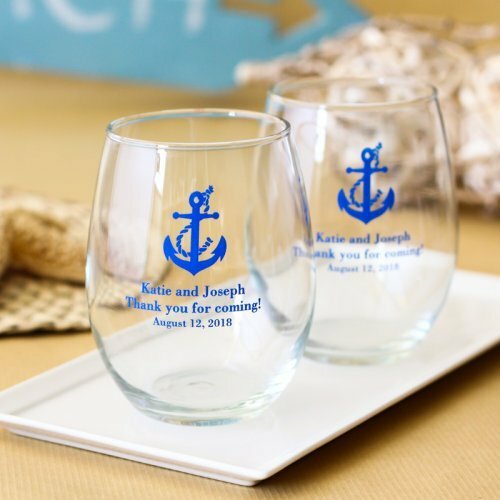 Easily incorporate the mellow vibes of the sea into your wedding by way of a nautical theme. The color scheme is fresh, the patterns are stream-lined, and the accessories are whimsical. 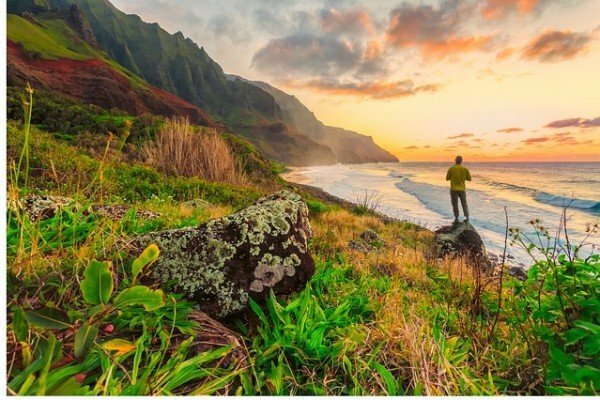 Sounds like a “shore” thing to us! First and foremost, if you want to create a beautiful nautical dreamscape, you must start with décor as this is the first thing guests will notice. 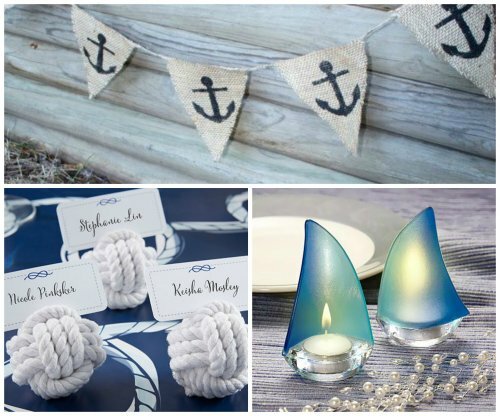 You can do this by incorporating nautical banners, sailboat tea light holders, and rope place card holders. 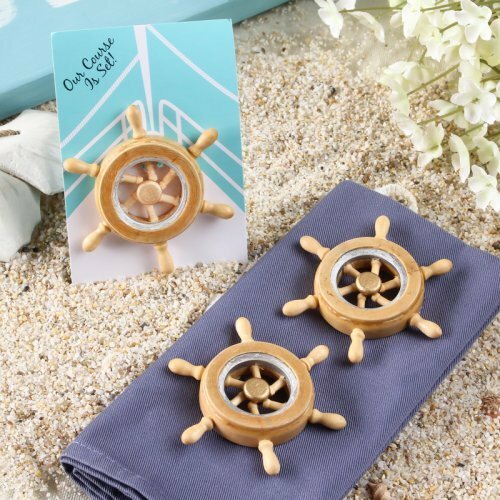 When it comes to nautical themed wedding food, we think you should go ahead and play with your food! Have fun with this theme by offering bite-sized fish and chips and sailboat inspired deviled eggs during cocktail hour. 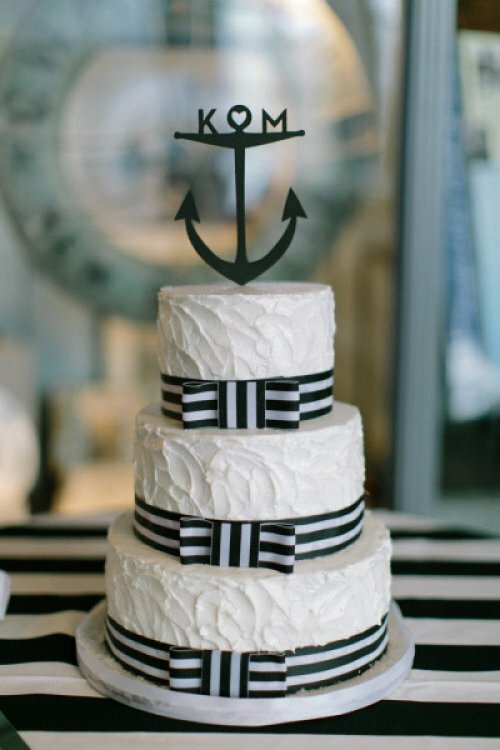 And definitely offer a gorgeous nautical cake to end the evening. A fun idea for drinks, is to serve up a signature cocktail in on-theme glassware. You can even personalize it for an added sentimental touch. There’s such creative freedom and fun when it comes to favors. 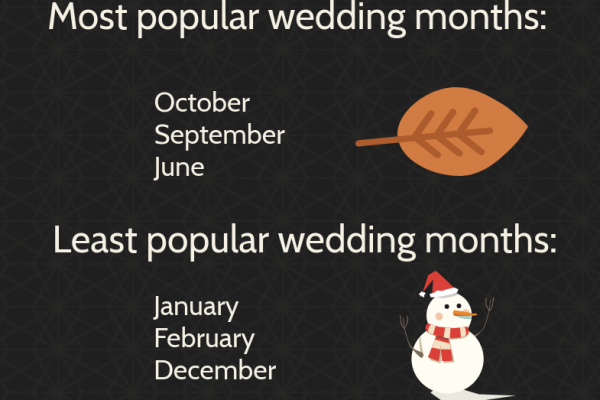 So for a cheery theme like this one, take advantage of all the opportunities! 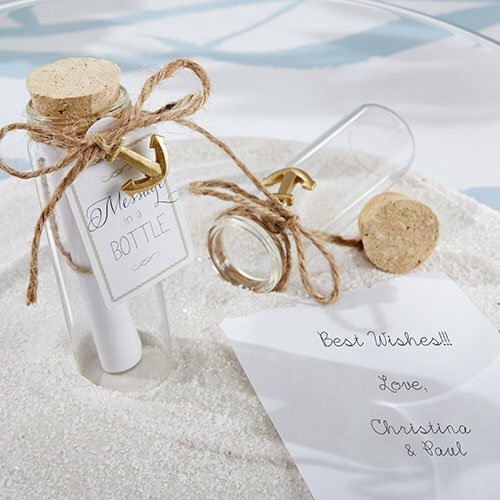 Messages in a bottle, ship wheel magnets, anchor bottle stoppers. SO.MUCH.THEMED.FUN! 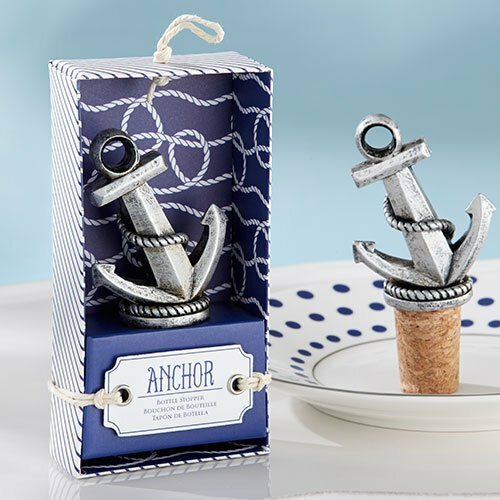 When creating a radical nautical tablescape, we’re totally digging this example found on Style Me Pretty. 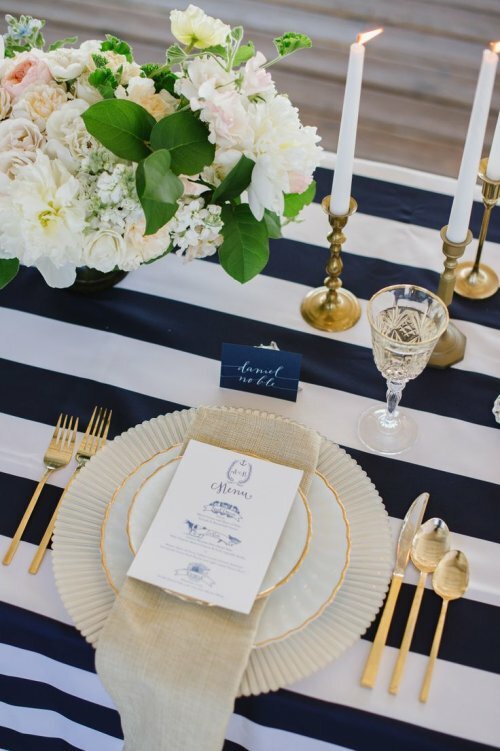 The bold stripes of the tablecloth, the gold accented flatware, and the crisp flowers all come together to create this pristine nautical end result. A.k.a. dresses and suits. What’s more nautical than navy blue?! It’s a gorgeous option for both bridesmaids dresses and men’s suit accessories. We also think this rope boutineare is an uber-cute added touch too! 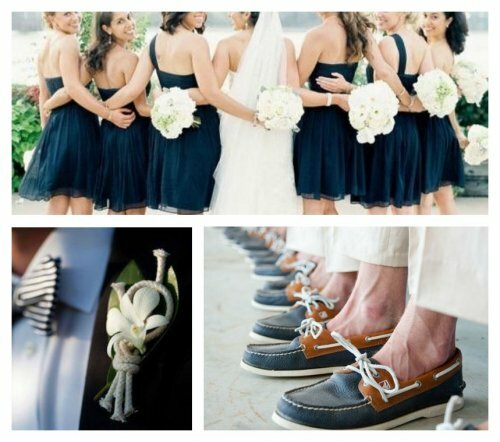 For even more nautically inspiring ideas, visit our Nautical Pinterest board!